KNAC.COM - News - METAL JAM 2016 This Weekend In Long Beach! METAL JAM 2016 This Weekend In Long Beach! 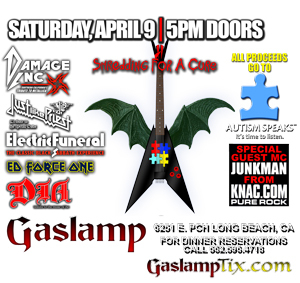 All Proceeds Going To Autism Speaks The 2016 edition of the annual METAL JAM will take place this Saturday, April 9th at the Gaslamp in Long Beach, California at 6251 E. PCH. And for the 13th time, KNAC.COM DJ Junkman will be hosting this event! METAL JAM is an annual Los Angeles Jam-for-Charity, where everyone's a star! Grab your guitar, bass, mic, or drums and get ready to rock out with Los Angeles's finest musicians for a good cause. Proceeds from METAL JAM 2016 will go to benefit AUTISM SPEAKS - an organization of parents, clinicians and leading scientists committed to accelerating the pace of biomedical research in autism through raising money for research projects, education and outreach. Please take a moment to check out their website and learn more about Autism and what you can do to help. AUTISM SPEAKS is a great organization that is doing great things to accelerate the pace of biomedical research in autism by raising money for research projects, education and outreach. To donate directly to AUTISM SPEAKS formerly Cure Autism Now, HERE. METAL JAM is a charity event, however there will be a $5 presale charge (www.gaslamptix.com), and a $10 cover charge at the door to attend. Donations throughout the night are encouraged but not required. The more we make, the more we give. As in the past, we will be raffling off various items throughout the evening. Items are donated by generous business owners, musicians and various music stores or websites. For more information and to check out the song list for this year's event, check out the Official MEATL JAM website right HERE.